This was a surprisingly easy recipe I invented. Fair Foods gave us two bunches of slightly bruised/browning bananas and a loaf of what I thought was sandwich bread when I took it, but ended up being cranberry walnut bread. None of us are particularly crazy about the nuts-and-dried-fruits category of foods, so I tried to think of things I could do with it. I figured it would be improved if it were sweet, and this led me to French toast. I knew bananas are often used by themselves as a binder/thickener in a lot of vegan cooking, so I figured this would work. I blended the bananas using an immersion blender, then added some vanilla and pumpkin pie spice. If using fresher bananas, you'd probably need to add some liquid to get it to a thinner consistency, but this was correct since these were rescued bananas. I then soaked the slices of bread in the stuff and fried them in a nonstick pan with a little oil. 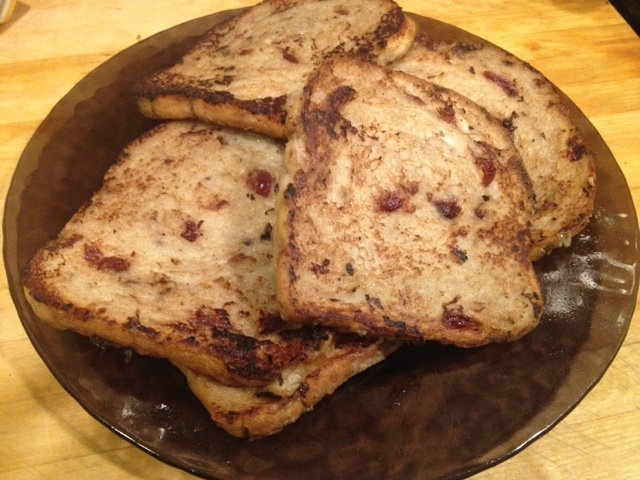 The result was normal textured French toast with a bit of a banana/fruit/nut flavor. We served it with maple syrup (Amazon has the best prices usually, FYI) and everyone enjoyed it. It's probably one of the simplest things I've ever cooked. Will definitely make again.